Hello readers! You’re not going to believe this, but I’m writing this second blog…whilst on another bus. No, it’s not a self-indulgent past time of mine nor is it a prime hotspot of writing juices to flow, but it just so happens that my trip up to Philadelphia for the long weekend gives me about 4-ish hours to share with you some of my experiences in the program over the past 6 weeks. And while they’ve passed by incredibly fast, each one of them has been completely, utterly, exhaustively amazing. Interning at the East-West Center (that’s right, it’s US spelling) has been an amazing experience as a first internship. As a public diplomacy and educational outreach office on South-East Asian affairs my primary role has been contributing to projects through writing articles and contributing to Center publications. But as always, there’s so much more to a workplace than the job description. In my time here, I’ve broken out of my comfort zone travelling to the Pakistan embassy twice to collect an employee visa, I’ve taken the initiative to attend events all across DC and I’ve applied myself in new ways through our research project on the firm. Whilst there’s still three weeks left, I find myself perpetually drawn back every Monday with the promise of good office coffee, an incredibly friendly and positive work environment and sharing stories with the fellow interns. Punctuating all of this are the classic office shenanigans that persist everywhere. From watching the intern booths slowly fill up whilst we’ve been here (we interns now outnumber the staff) to comparing notes on word pronunciations with employees within the sanctity of lunchtime, to the never-ending expeditions to raid the jellybean dispenser, working in the office has been an absolute blast. The classes here have also been breathtaking. Having the privilege to study under professors and industry leaders with such intimate experience in their fields from electoral politics to medical anthropology to research and presentation skills combined with their willingness to share their stories has been incredible. It’s this inherent passion that keeps drawing me back, inspiring me to work harder and quite possibly guiding my interests and hobbies back in Sydney. If anything, the weekends here at DC have been the epitome of spontaneity, embodying the core of student life and only perpetuated by the ease of transportation provided by Uber and the metro system. My roommate once complained that our late nights and even later mornings meant we’d never complete more than one attraction a day, a sentiment that we’ve since disproven but which reflects the very essence of DC. There is just so much more to do here when you’re not spending 3-4 fleeting days as a tourist and each attraction from the monuments, museums and restaurants have so much to offer. 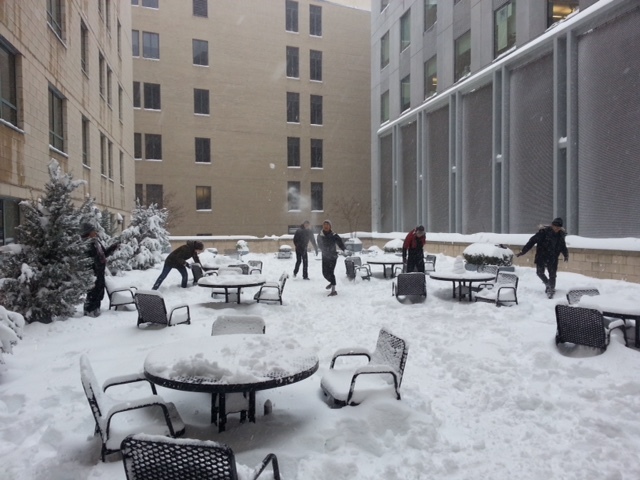 Intimate moments like snowball fighting on the courtyard, travelling out to Virginia just for all-you-can-eat Korean BBQ and cupcake sampling on the trendy streets of Georgetown will stick with me forever. As we get towards the pointy end of the program I find myself simultaneously excited and nervous. With just three weeks left there’s still so much to do, so many assignments left untouched, so many attractions still undiscovered and so many more memories to be made. Staring out as the highway speeds by and we head up to try the famous Philadelphia Cheese Steak, I resolve myself to make the most of what’s left of DC and I’ll definitely be there to share those moments with you next blog. Until then, stay safe and enjoy the start of Sem 1!